BHIWANI: In a suspected case of honour killing, a man reportedly shot dead his minor daughter in Rewari Khera village of Bhiwani district on Sunday night and cremated her body secretly. Police have registered a case of murder against him and started investigations. Accused Ratan Pal reportedly shot dead his 15-year-old daughter, Nisha, a student of class X, on Sunday night in their house. The family however said it was an accidental death as the girl pressed the trigger while holding it. The body was cremated hurriedly without informing police. Sources said that a villager informed police about the incident after which Bhiwani SP B Satheesh Balan, along with forensic experts, visited the cremation ground and collected samples for investigation.The SP told TOI that a case under section 302 has been registered against the father, who is absconding. “We have started investigations into the incident. The motive behind the murder is unclear so far”, he said. Police sources however disclosed that the accused, who is an ex-serviceman and now employed with a foreign embassy in Delhi, had returned home on Sunday. 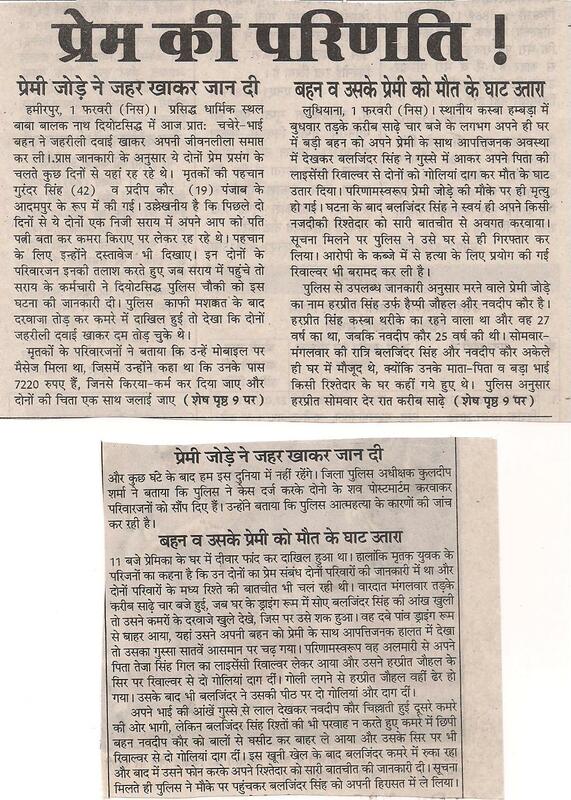 “Some arguments seemed to have taken place between the girl and father after which the accused fired at her”, they added.Meanwhile, the SP has placed the incharge of Gurgani police post under suspension on charges of negligence in duty as he failed to act swiftly after the matter was reported to police by an anonymous caller. According to reports the youth and the girl, belonged to different castes and were having an affair for sometime, but their relationship was not approved by their families. Sources claim they had a secret marriage in court as well. On Wednesday last, the youth had approached the police with an application saying the girl’s family had held her ‘hostage’.The police, after taking statement of the girl, asked her family members to release her and allow her to live with her husband. The couple, however, eloped on Thursday triggering tension in the village and prompting the elders to convene a panchayat. The panchayat, deliberated on the matter on Friday at Kaserwa village in the district, and allowed a day for the family of the youth to produce the girl. If they failed to do so the sister of the youth would be married off to a boy from the girl’s family. At the panchayat, the youth’s father was asked to produce the girl immediately but he expressed his helplessness and said he had no idea where they were. The panchayat dispersed after giving him one day to comply with the directive. The pradhan (village chief) Tahir Ali said the girl’s family must have helped them elope to create pressure on the youth’s parents. Police officials said they were investigating the matter and take stern action if the report was found to be true. Going a step further, the panchayat of Thakur-dominated Ghori Bachera village, not far from the national capital, has also formed a team to execute its orders. The couple, Javed and Shaista, have gone into hiding fearing for their lives. 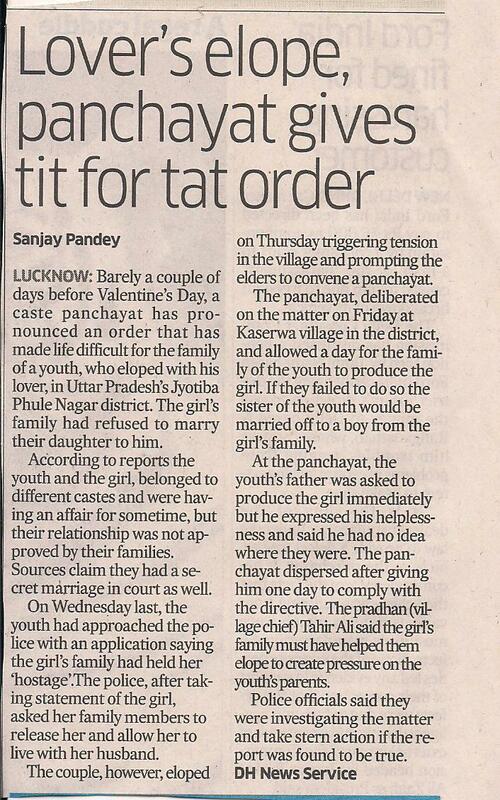 The panchayat has asked the maternal uncle of the girl Mehendi Hasan to produce the lovers before it. “The panchayat has been putting pressure on me to bring the couple to the village and has asked me not to return until I implement their orders,” Hasan said. Javed said the panchayat was angry over their marriage as it felt that it had brought a bad name for the entire village. “I have come to know that the panchayat has ordered that our eyes be gouged and we be shot dead,” a terrified Javed said. Javed and Shaista were neighbours in Ghori Bachera village. They fell in love and eloped from their homes and got married in the court a few days ago. Surprisingly, members of the couple’s families, according to Javed, were not part of the panchayat’s decision. 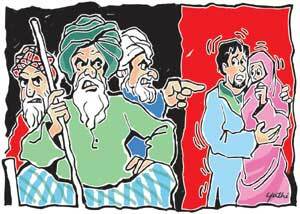 “They (families of the boy and girl) are neither in favour of the marriage nor against it,” he said. “We are scared and need security,” Shaista said. There is no reason for the panchayat, whose members do not belong to their community, to interfere in the matter. Meanwhile, the police said they are looking for the couple and will provide them with security. A case has also been registered against some of the members of the panchayat, they added. Recently, in the Jat-dominated western Uttar Pradesh, where honour killings for marrying against the wishes of the family are quite common, the all powerful “khaps” (caste panchayats) had announced that they will not allow love marriages nor a marriage within the same clan. The victims have been identified as Navdeep Kaur, daughter of Teja Singh Gill, adviser in the District Congress Committee, and Harpreet Singh Johal, alias Happy (25), from Thrike village. The police said Teja Singh, his wife Shinder Kaur and younger son Harjinder Singh (18) had gone to visit a relative in Kishanpura village near Moga. 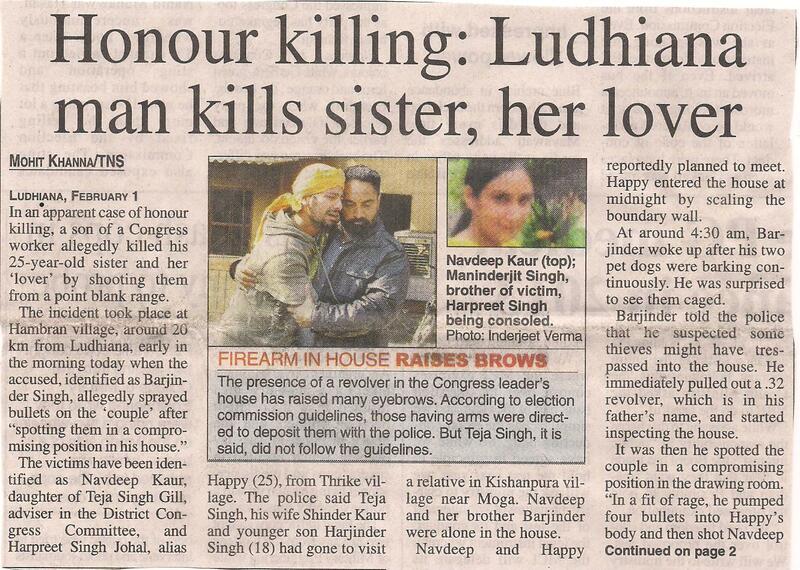 Navdeep and her brother Barjinder were alone in the house. Navdeep and Happy reportedly planned to meet. Happy entered the house at midnight by scaling the boundary wall. At around 4:30 am, Barjinder woke up after his two pet dogs were barking continuously. He was surprised to see them caged. Barjinder told the police that he suspected some thieves might have trespassed into the house. He immediately pulled out a .32 revolver, which is in his father’s name, and started inspecting the house. It was then he spotted the couple in a compromising position in the drawing room. “In a fit of rage, he pumped four bullets into Happy’s body and then shot Navdeep in her temple,” said investigating officer Swarn Singh. A close aide of Teja Singh, who was sleeping in the office located outside the house, rushed to the crime site after hearing gunshots. According to Hambran Chowki in charge Sarabjit Singh, after killing the duo, Barjinder reportedly informed his father and mother about the incident. Later, he surrendered before the police and confessed to the killings. 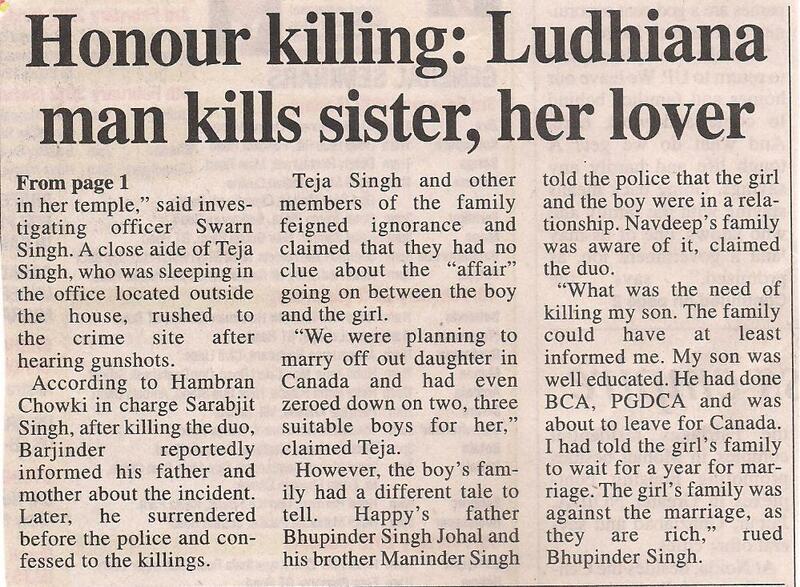 Teja Singh and other members of the family feigned ignorance and claimed that they had no clue about the “affair” going on between the boy and the girl. “We were planning to marry off out daughter in Canada and had even zeroed down on two, three suitable boys for her,” claimed Teja. However, the boy’s family had a different tale to tell. Happy’s father Bhupinder Singh Johal and his brother Maninder Singh told the police that the girl and the boy were in a relationship. Navdeep’s family was aware of it, claimed the duo. “What was the need of killing my son. The family could have at least informed me. My son was well educated. He had done BCA, PGDCA and was about to leave for Canada. I had told the girl’s family to wait for a year for marriage. The girl’s family was against the marriage, as they are rich,” rued Bhupinder Singh.